With 308,480 total acres of land in Door County and natural features as diverse as bluffs, forests, farmland, cedar swamps, streams, and lakeshore, how does the Land Trust decide which properties are most deserving of protection? This question goes to the very center of the Land Trust’s mission to protect Door County’s exceptional lands and waters forever. One part of the Land Trust’s process for identifying exceptional lands involves collaboration with a number of conservation partners that is done at a macro level. In a yearlong series of meetings held by The Nature Conservancy, they along with the Land Trust, The Ridges Sanctuary, U.S. Fish and Wildlife Service, Wisconsin Department of Natural Resources, Door County Soil and Water and the Door County Planning Department met to look at Door County as a whole and to share available scientific data such as hydrological studies and biological inventories. From these meetings, the partnering groups were able to create current conservation priority maps and agree on a set of collective goals. 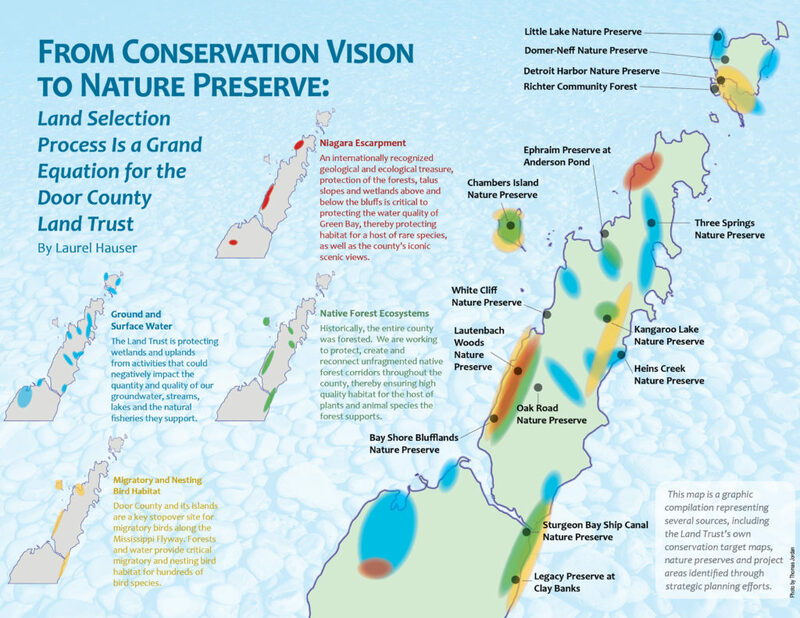 The goals included identifying gaps in the conservation work being done, creating corridors of protected lands, supporting each other’s conservation objectives, and the health and well-being of the Door County community. In addition to developing overarching goals with partnering agencies, the Land Trust developed a strategic plan to guide its work from 2015 through 2019. The plan includes two priority goals that give guidance to the selection of properties. First, the Land Trust aims to establish and protect self-sustaining and resilient natural communities. Secondly, the Land Trust will extend land and water protection to new areas in Door County. To support these goals, the plan identified four conservation targets that focus the Land Trust’s work. These targets are: 1) Door County’s best remaining native forest communities and the host of rare and threatened species they support; 2) the Niagara escarpment and its unique microhabitats; 3) lands impacting the water quality and natural fisheries of Lake Michigan and Green Bay; and 4) migratory and nesting bird habitat. The Land Trust will focus their conservation efforts in the areas shown on the map to the left. Conservation in these areas directly supports the Land Trust’s strategic plan. With these specific goals and targets in mind, Land Trust staff utilizes tools such as our Project Assessment Form, a document designed to evaluate a property’s merits. For each conservation project, we answer a standard set of questions to determine if preservation is a strategic choice. Evaluating and recommending conservation projects falls under the purview of the Land Trust’s Land Policy Committee. If the Board of Directors votes to approve the recommendation, we work to secure the property’s protection, write grants and raise needed private funds. We will develop Land Management Plans to guide the long-term stewardship and public use for the property. Finally, we enlist the help of volunteers for projects such as trail-building and habitat restoration, turning a conservation vision into a publicly accessible nature preserve.